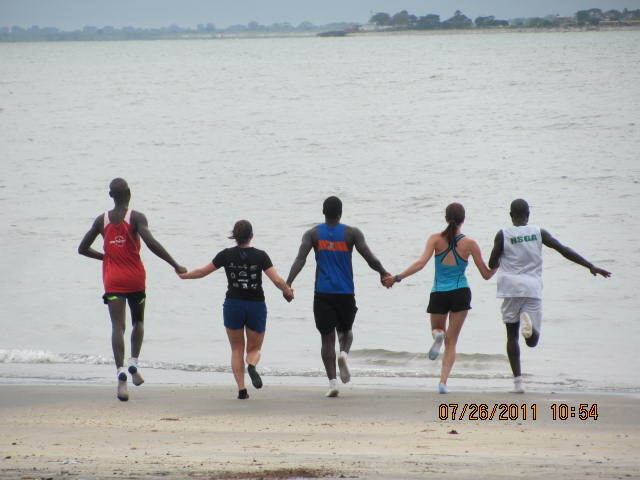 On Tuesday, July 26, Team Love4Gambia: Erin Poirier, Ashley Sharpe, Pa Modou Sarr, Kebba Suso and Dodou Bah, victoriously jumped into the Atlantic Ocean in Banjul after running 424km over 17 days across the country of The Gambia. We reached the ocean because we believed that we could do it; we supported and took care of each other every step of this crazy journey; and because we had such vital and wonderful support from you. Please accept our most sincere thanks for your generous support of our run. 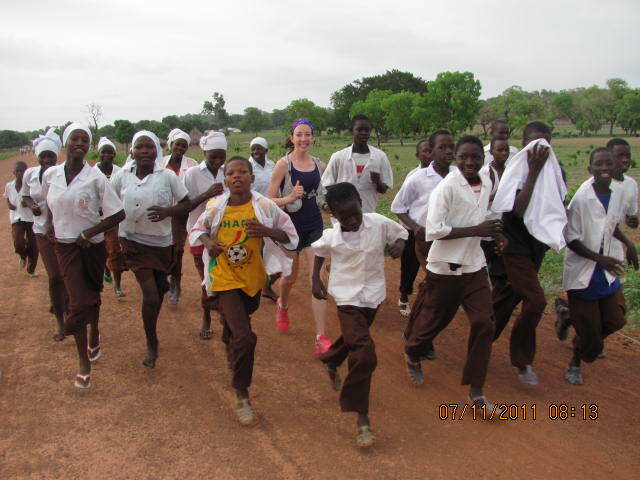 Without personal donors, corporate sponsors and in-kind support from the Halifax running community, our team would not have been able to take our first steps from The Gambian border with Senegal. We learned a lot about the human body and spirit on our 424km road to Banjul. I was getting stronger and faster each day. My body was able to do it. I ran more kilometers with my teammates than I did solo. The heat (37-42 degrees) never impacted my running performance because I chose not to let it. Still, it was far from easy. Sometimes we hurt and were tired. But each time we were joined by children and youth, all traces of fatigue and pain vanished. We were running for these kids, for NSGA programs that impact their lives. With them running next to us, we felt like we could fly. Many Nova Scotians tell me that they could never run as far as I did or in the heat that I ran in. I think that maybe these people just haven’t put themselves in a situation where they are determined to reach their goal- no matter what. I am just a regular girl with some talent for running who worked really hard for 7 months to prepare for a really difficult challenge. I was going to run to the Atlantic Ocean in Banjul, no matter what. I never once doubted that I would get to the ocean. Managing 42 degree heat was all about being strong. The human body will allow you to be strong enough if you will it to be strong enough. I arrived home with something amazing inside me- what we achieved together when we ran into the Atlantic Ocean in Banjul. We raised more than $34,000 that will support Pa Modou, Kebba and our NSGA Gambia staff as they continue our lifesaving work in the field: keeping kids alive. But I also returned home with something missing: my team. I’m back on the roads in Halifax, running, but feel the absence of my Gambian team with each step. I don’t think that this will be the end for me and my amazing team and our work to support the NSGA. I hope that you’ll continue to support the Nova Scotia-Gambia Association as our story continues to unfold. Can totally understand why you would miss your team. It may take a while to readjust but you will never forget this journey. so true, Dawn. Thank you. thanks Joanne! your support is amazing! See you soon!